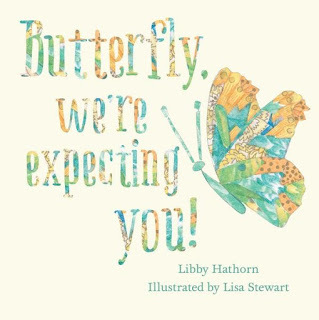 Butterfly We’re Expecting You is a gentle story that helps the reader reconnect with and appreciate the gentle innocence of childhood. In this story two children, a boy and a girl, are exploring the beauty of nature in their garden. The children are waiting to see a butterfly, the bees, a lizard, a frog and the birdies. In the second half of the book the children find what they are waiting for. But will they see the dinosaur they imagine underground when they find some bones in the dirt? The author’s love of poetry is evident in the rhythm and rhyme used in Butterfly We’re Expecting You. Libby Hathorn has created a lovely and unhurried mood in this read-a-loud story. The soft pastel colours used by illustrator Lisa Stewart gives the story a feeling of being bathed in the natural sunlight. The ideal place to share this sweet and gentle story is a peaceful and quite spot.